Suicide Bombing Causes Multiple Deaths In Afghanistan : The Two-Way The explosion happened near the site of an upcoming gathering of Afghan elders. There was no immediate claim of responsibility. An Afghan police officer stands near some of the wreckage after Saturday's suicide bombing in Kabul. A suicide bombing Saturday in Kabul, Afghanistan, near the site where elders will meet next week to debate a security pact with the U.S. caused multiple deaths and injuries, NPR's Sean Carberry tells our Newscast Desk. "The huge blast destroyed cars and shops and scattered debris for more than 100 yards. Witnesses describe seeing injured and dead civilians being pulled from the scene. 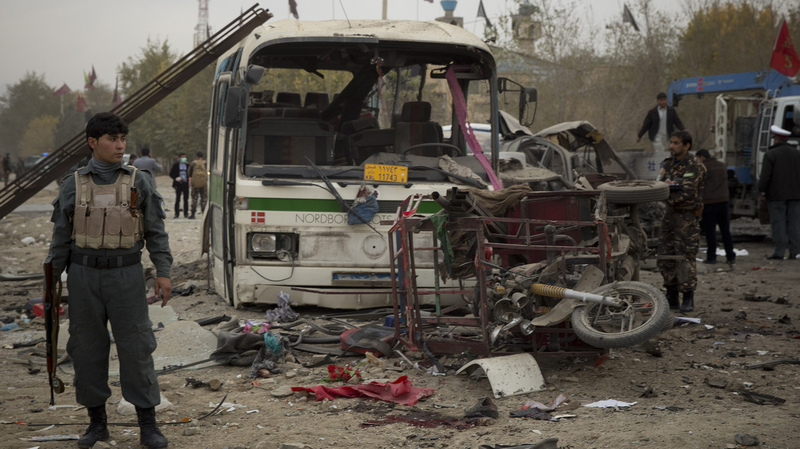 Afghan officials claim the bomber was under surveillance and exploded his vehicle when stopped at the checkpoint." According to the BBC, at least 10 people were killed and more than 20 others were injured. The security pact, as All Things Considered has reported, would "keep U.S. troops in Afghanistan after the NATO mission ends next year." But a key issue to be debated by the Afghan elders is whether U.S. troops will be subject to Afghan or U.S. law. If they insist on Afghan law, that could lead to the agreement's collapse. Afghan officials, Sean adds, doubt the site of the elders' upcoming debate was the target of Saturday's bombing. As of mid-morning in the U.S., no group had claimed responsibility. Afghan President Hamid Karzai has said the Taliban is welcome to send a representative to the elders' loya jirga.